Mayfield Dental was established in 1972 and was taken over by Deepali and her team in 2012. It is conveniently located in a quiet neighbourhood, a stones throw away from Sanderstead station. The practice has recently undergone refurbishment, giving it a fresh, clean feel. We offer a full range of dental treatments from hygiene cleans to various cosmetically enhancing treatments. All treatment options will be discussed in depth with you, and tailored to meet your needs, but you will ultimately have the final say. If you would like to find out more about our treatments or if you are nervous about visiting the dentist, please call us on 020 8657 1291 and we will be more than happy to have a chat before making an appointment. We feel it is essential to maintain a personal relationship and so we endeavour that you always see the same dentist. This is important so that you feel at ease and know that you are being cared for by someone who is familiar with you and your dental needs. 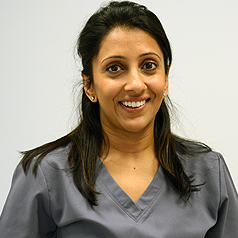 Since qualifying from Kings College London in 2006, Deepali has been working in General Dental Practice. With a keen interest in Aesthetic Dentistry and improving peoples smiles, Deepali went on to complete a year long Advanced Restorative and Cosmetic Dentistry Course in London Bridge in 2009. She can offer a full range of dental treatments, including teeth straightening using Six Month Smiles. Her treatments are carried out in a caring and professional manner. In her spare time Deepali enjoys socialising with friends and family, as well as travelling.